Though it looks like any other 1980's Mercedes E-class, this is actually a very rare 1987 Mercedes 300 TD (Touring Diesel) station wagon and it is the newest addition to the Hooptyrides fleet. This is the second 1987 300TD that I have owned which I immediately regretted selling. And I have continued to regret. The modest 300E hides its capabilities... The 300E is among the world's best cars for the driver. Precise steering and comfortable ride make them particularly good long-distance cars... Discussing the handling of these cars is academic. Anything that you can do to break them loose on the public road is not only irresponsible and illegal, but also unlikely. With absolute conviction, I can say, the 1987 Mercedes 300TD is one of the very best automobiles ever made. Though I don't have 7 friends, should I acquire a few more, I will be able to bring them with me in absolute comfort. It is a 6 cylinder turbo charged diesel and it was only available in 1987. 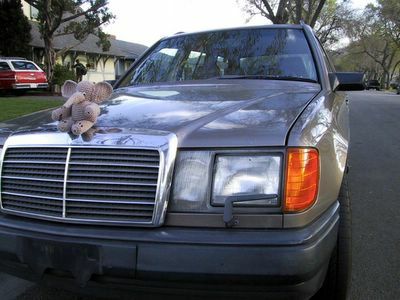 The W124 body cars (the 80s E-classes) were the last true Mercedes that felt like they were machined from a single block of steel. Though diesel is often snickered at as being a poor performer and a black smoky mess, it does not tell the true appeal of diesel. First off, the smoke. Hell yes it smokes. Big clouds of smoke. That fits clearly into my favorite category of problems - the Department of Somebody Else's Problem. If I drove the car from the rear bumper, it would be my problem. Sure, the prior 4 and 5 cylinder, non-turbo charged diesels were slow as hell, but that's why the 1987 Mercedes 300TD is so great. Only 1987 saw the full 6 cylinder diesel performance. The acceleration is not bristling, but the speed is absolute. At high speed, the Mercedes W124's hunkers down and holds the road like no other car. The driver feels absolutely connected, aware and uncommonly safe. It is a car for individuals that enjoy driving and don't want to be divorced from the action. It is a car of respect. I do not feel abused and cheated as I do in most modern cars. The W124 represent an absolute end of a marquee. Mercedes Benz has sold its soul as they tried to be more like BMW and Lexus. They lost the uniquely Mercedes feel of absolute integrity as they tried to build a light and nimble car like the BMW. The new Daimler Chrysler's are not Mercedes' and they failed to be as good at being a BMW as BMWs already are. The 300TD is not a Bugatti or a Porsche GT, it is a car for practical people that want to be treated tenderly. It is a transition car - a throughly modern driver that still has a soul. I will buy as many 1987 300TDs as I can find and keep them in mothballs in the desert so I will never have be without. Just to get it sorted, a carefully selected used Mercedes will require initial year repairs equal to the purchase price of the car. And for ever after, you will spend that initial purchase price again and again. A poorly researched and carelessly selected Mercedes has no upper monetery limit. $1000s of dollars per month until you cry uncle. Recently, I was very impressed by a stylish and subtle homemade hood ornament. Since I debadged the 300TD to further its stealth qualities, I am in the market for such a hood ornament. The elephant is pretty damn close. The aesthetics, materials and quality of knitting are dead on, though I think the scale is off. Just a little bigger would be perfect.